What a pretty card Sylvie, I just love that lace. Ooh, this is so pretty! Such a gorgeous stamp and the delicate colours are perfect! Thanks for joining in with the Penny Black challenge! Oh what a gorgeous card, elegant image and fab colours. 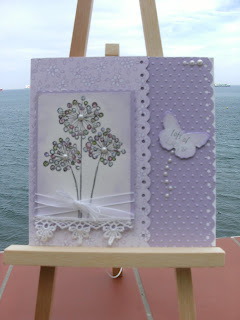 Gorgeous card... Love the texture and the scalloped edges...so pretty. Ooh what a beauty Sylvie, loving these soft tones and your pearls and lace are gorgeous as is that beautiful bow. Sylvie this is stunning I love it.